Post top or suspended mounting, recommended height up to 6m. On steel columns Ø60mm with adaptor (code 96629564). On die-cast columns with threaded spigot. Universal joint code 96262636 allowing compensation of any possible default of verticality support in case of straight fixing. Access to replaceable LED plate via 4 screws after opening the hinged canopy with 1 screw. Delivered in kit to be assembled through 3 easy steps. Pre-wiring to be added through a 4th additional step before installation on the pole, delivered with a 5m cable H07-RNF as standard for post top version, all supplied in one box. Complete with factory setting 700mA integrated Bi-Power dimming, switchable by the installer to 3 other dimming profiles, 525mA or 350mA, and no dimming. 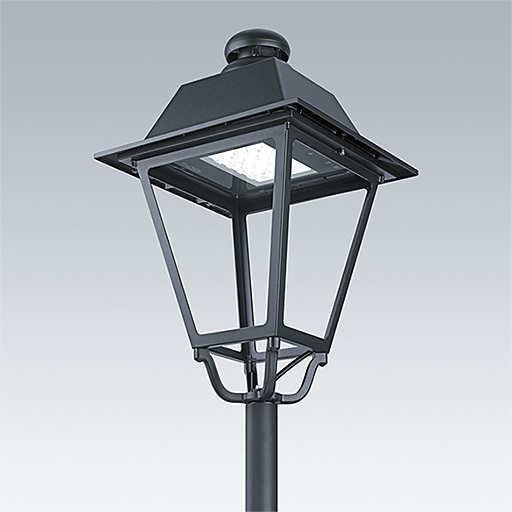 IP66 post top and suspended 19th century style die-cast aluminum lantern up to 122lm/W efficiency, black textured finish, with asymmetrical and rotational symmetric optics, dimming system, and co-ordinated columns and brackets.